Relieving stress with aromatherapy is as simple as combining essential oils and using them for massage, bathing or diffusion. Sometimes it takes a holistic alternative to relieve stress like inhaling the vapors of a calming essential oil. The art of aromatherapy, which uses essential oils, harnesses the pure essences of various flowers and plants to work on the nervous system and restore harmony. Aromatherapy is an ancient practice which uses the essential oils extracted from plants to treat and heal imbalances in the body, mind, and spirit, and to improve health. Aromatherapy is actually a form of herbal medicine, but instead of using the entire herb, aromatherapy uses the fragrance and essence of the herb when it's compressed. Inhaling the scents of these essential oils is said to interact with your brain to cause a strong positive impact on your mood. Fighting occasionally feeling blue, occasional heartburn, gas or stomach upset ; occasional sleeplessness; oily and troubled skin. This is our own blend created especially for fibromyalgia customers. Combining essential oils of lemongrass, ginger, sweet orange, and lavender, we created a support blend to help relieve some of the symptoms of fibromyalgia such as, pain, care for the skin, to alleviate tension and fatigue, to invigorate the entire body, mind and spirit. Being one of the best remedies for indigestion, stomach ache, colic, diarrhea, flatulence, spasms, and other stomach and bowel related problems. Well known for its sedative properties and for its ability to help calm stress and anxiety and to help promote sleep. If used in excess, however lavender oil can actually act as a stimulant. Reduces the pain associated with colds, fevers, inflammation, overexertion of muscles, toothaches, headaches, muscular and rheumatic pain, sprains, strains, bruises and stiff joints and numerous other sources. Often used as a general sedative for the nervous system, stress-related issues and emotional pain are often treated with Neroli. It is also said that the oil can help to treat insomnia, anxiety, and depression. 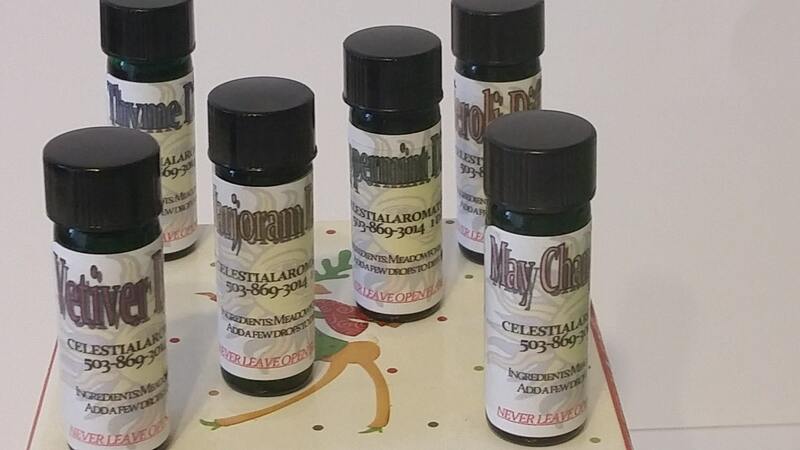 This is our own custom blend of Peppermint and Lavender essential oils. You get the healing properties of Lavender and the cool and tingling sensation of Peppermint. Has a calming effect, yet can act as a stimulant. It stimulates the nervous system, and can help children with add. Can be used to treat acne, oily skin, and wounds, as an antidepressant it can be worn as a perfume or used at night to ease insomnia.